The Solution below shows the A-sharp major half cadence on the piano and treble clef. This step shows the half cadence in the key of A-sharp major. So in this major key, we are going from the A# major triad chord #ii - B# minor chord, to A# major triad chord #V - E# major chord. 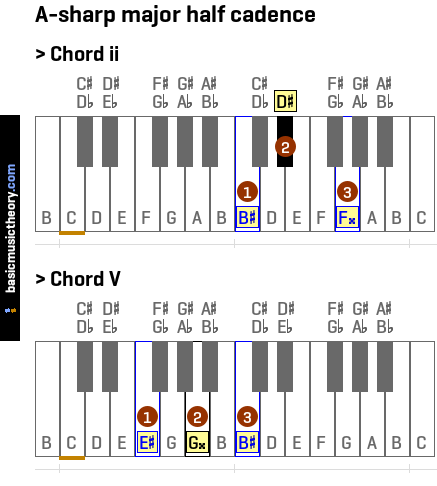 To demonstrate this, on the treble clef above, chords A# major triad chord #I, A# major triad chord #V, and A# major triad chord #IV are used to set up the phrase as being in this key, then the cadence chords ii and V finish off the phrase, giving only a partial sense of completion, in comparison to the A# major perfect authentic cadence. Before describing the details of the half cadence in the key of A-sharp major, first it would be to useful to identify the scale notes, degrees and chords that could be used in this key. This step shows the A-sharp major half cadence on the piano and treble clef. 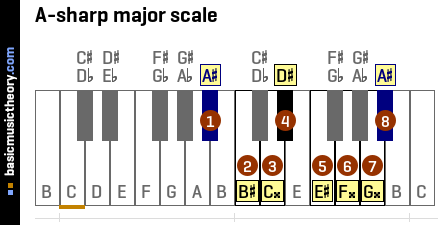 So looking up the chords relating to these scale degrees from the table above, we are going from the A# major triad chord #ii - B# minor chord, to A# major triad chord #V - E# major chord. It is less strong than the A# major perfect authentic cadence, because it doesn't give the same sense of closure or completion to the phrase, since a music phrase will usually sound most complete when the tonic(I) is the final resting place. This means that the half cadence is often used as a pause in a piece of music, which finally ends using the A# major perfect authentic cadence. To do this, we are using chords A# major triad chord #I, A# major triad chord #V, and A# major triad chord #IV, and after hearing these chords, followed by the first chord in the cadence (chord ii), our ear is definitely expecting the tonic chord (I) as the final chord in the sequence. Instead of resolving on the tonic chord, by resolving on the dominant chord, the sense of resolution and finality is not there, in comparison to the A# major perfect authentic cadence.